It took a while for The Shipping News to get its hooks in me. 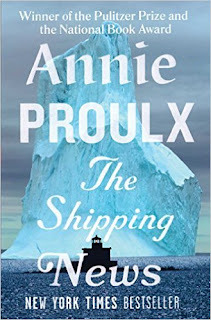 I was thrown off by Proulx's linguistic style, choppy and fragmented (and wonderful, once I got used to it); her powerful but challenging vocabulary choices (Petal Bear was crosshatched with longings, but not, after they were married, for Quoyle). But then the story took off, darkly comic, shocking but somehow charming, and I was happily sucked into the frigid Newfoundland landscape. Give me an underdog any day. Give me someone lost and unsure and stumbling through life. The older the better. Give me the Quoyles of the world, trampled by the cruelty of others, sabotaged by their own poor choices. Give me quirky townspeople, big hearts who've bloomed to fullness in small places. Give me late-in-life, last-chance love. I'll take all of them in real life, any day, and sure enough in my novels. I absolutely loved The Shipping News, for all its forgivably flawed humanness. Proulx's use of metaphor on a grand scheme is absolutely stunning; volumes could be written about her iceberg-ridden, treacherous northern seascape. It's a book to curl up with right now, in the dead of winter, and be comforted by characters who've been to hell and back and are stronger for it.